In high school, in the tiny eastern North Carolina town of Cerro Gordo, Shaheerah Nur Id-Din remembers thinking about her career choices and asking herself what the one thing was she would do even if she didn’t get paid for it. 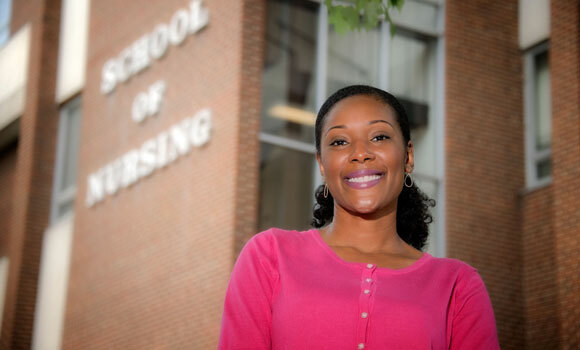 It’s not surprising that when she came to UNCG, she decided to major in nursing. Eleven years later, she still loves the profession, but wants to have a bigger impact. After earning a master’s degree in nursing from UNC Chapel Hill and working the last six years as a family nurse practitioner, she decided it was time to return to school for more education. She picked UNCG for her Ph.D. program. This year marks the program’s 10th anniversary. “I had such a positive experience during my undergraduate years,” she says, citing Dr. Robin Bartlett, a nursing professor and head of the doctoral program, is one reason why. The Ph.D. program will give her the experience and credentials to expand her career into teaching and research. “I’m very interested in research and I just wanted to be able to disseminate new knowledge and practices that will significantly impact the nursing profession,” Nur Id-Din says. She especially wants to help HIV-positive women. UNCG’s nursing Ph.D. typically takes 3-4 years to complete, depending on the course load students carry. Nur Id-Din plans to start out as a part-time student while still working in Durham as a family nurse practitioner. She plans to eventually transition to full-time studies. “I knew that entering into a Ph.D. program would take a certain level of commitment and support, and I knew I would be able to get it at UNCG,” she says.